Christmas is a special time at our house. We try to do lots of activities as a family. Making memories is what the season is about. When it comes to gifts we try to be thoughtful in our giving. We do not want our children loaded up with a bunch of toys that won’t use. Instead, we try to mainly get them experiences, books, and educational toys. Here are a few of the items I am getting Harper this year. She is almost three and really interested in baby dolls, books, and puzzles. *We have this book already and love it. It is the reason we are buying the second book in the series. Harper even has a plush “idea”. Growing up I had American Girl dolls made my the Pleasant Company. We used to attend American Girl tea parties at a local bookstore. I have my original dolls to pass on to Harper when she is older, until then she is getting a bitty baby. 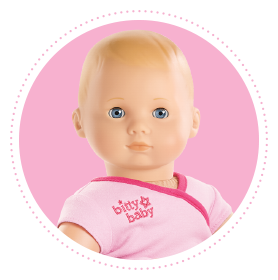 I love the bitty baby because there are so many different looking babies to choose from. Harper recently became a big sister and loves helping with her brother so I think this doll will become a favorite since she will be able to mimic some of the things I do with the baby that she cannot do with him. This toy can be stacked and sorted all different ways. It is a great screen free activity that keeps little ones busy. Harper loves playing with this at her best friend’s house so I can’t wait for her to get her own. Splish Splash Kids Bath Set from BEAUTYCOUNTER.